After 2 years of owning an Instant Pot I have finally become hooked on using it!! I know, it took me a while, however when I realized I could recreate the jammy collard greens we feasted on at Turkey & the Wolf during a recent trip to New Orleans in under an hour I knew I had to give it a try. 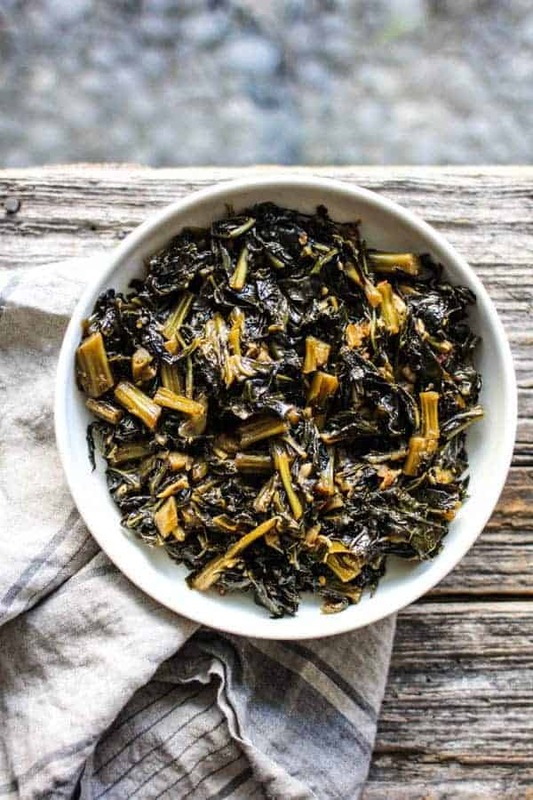 These collard greens are unlike any you have ever eaten before, I assure you of that! They are cooked in a brine of red wine vinegar, sugar, garlic, and spices which makes them irresistibly tangy and sweet with a little heat at the finish. While we love them on their own, they’re irresistible piled high on a tostada with roasted sweet potatoes and black eyed pea hummus! If you happen to be looking for more delicious ways to use your Instant Pot give these Instant Pot Baked Beans a try, they’re incredible!! Or for a meaty main, try our salsa chicken that has instructions for cooking in the Instant Pot and the oven! We love these as a side all on their own, but they’re especially delicious tucked between slices of Swiss cheese as a melt, piled high on tostadas. or even served over toasted bread with a poached egg on top. Set the Instant Pot to the Sauté setting (Normal/Med heat). When the display reads “Hot” add the butter. Once melted add the sliced garlic, vinegar, water, sugar, Creole seasoning, salt, black pepper, and red pepper flakes. Sauté stirring occasionally, until liquid slightly reduces, about 10 minutes. Cancel the sauté function so the pot will stop heating. Add the collard greens to the Instant Pot, use tongs to toss and coat in the liquid. Press Manual, set to sealing, and use the + or – button to choose 25 minutes. When cook cycle is finished, let the pot naturally release pressure for 10 minutes. Then manually release the remaining steam. Recipe adapted from Turkey and the Wolf’s collard green recipe featured on Bon Appetite. I am SO very glad that you love this recipe!! That means so very much. We do like our greens spicy, but I know it will still be delicious even without the heat. The Cajun seasoning adds a while new level of flavor, I hope you get to try that sometime too! Hahaha! I make my collards vegetarian for my husband, but you better believe when I make a collard melt sandwich I have a slice of bacon on it too! I’m making a vegetarian pot, and I added a couple of dashes of liquid smoke. 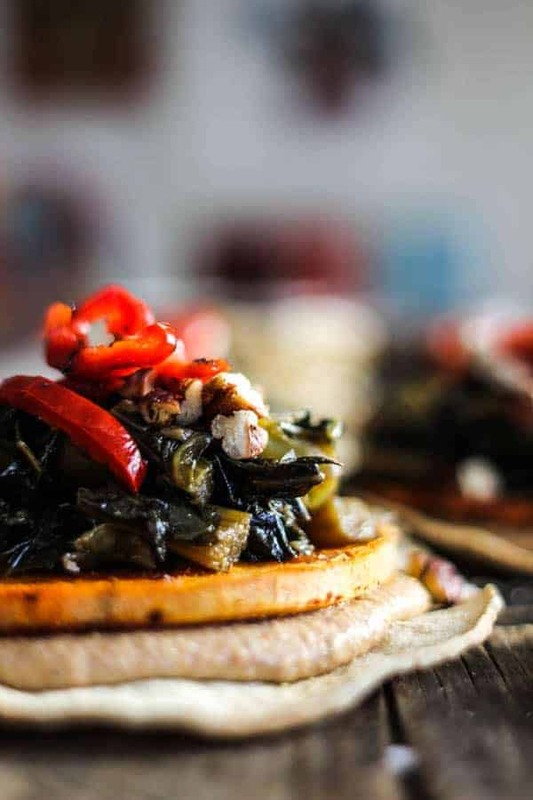 Best collard green recipe ever. So much flavour. Thinking you could sub in Kale too if necessary. As a Canadian, collards aren’t always available. Thanks for posting this recipe. I am so glad you love them Pamela! I could eat them every day myself, if you have any leftovers my favorite way to use them up is to make collard green melts with Swiss cheese. Best grilled cheese EVER! I love your kale idea. I am going to have to try that myself.